* sven & i watched cloverfield: dumb monster, but overall not a bad movie. i'm glad i saw it on the small screen, though. about halfway through we had to stop and rest so the room would stop spinning, and then we had to munch on candied ginger to keep from being nauseous from the handheld camerawork. * biking has been going pretty well when it's not randomly cold. i certainly missed rose while she was at the bike shop! i'm set to pass 100 miles on rose -- assuming my odometer can be trusted. i think its count may be quite high and i'll have to reset it. i've been practicing going up & down hills and getting the bike on/off a bus and i finally figured out my bike rack again, so i feel i can take her almost anywhere at this point. * also, i was in the alberta art hop parade! 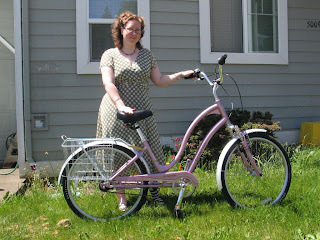 since i had a bike and a pretty dress, i joined in the "pretty dress" ride. then the people in pretty dresses biked along the alameda ridge and down to wilshire park for a picnic. yay! it was my first organized ride. the experience made me realize that if i lived 100 blocks west of here, i could bike almost anywhere in inner portland. * afterwards, i managed to see the current show at 23sandy: if you've never seen an orotone (a photograph printed in 24-karat gold), this is your chance! * sven, kristen, todd & i attended the last scratchpdx of the season. i wasn't sure i was going to go, but i knew one of the performers: 10-year-old frankie is the daughter of one of my artist's way clients. * i got called to serve on my first jury duty in oregon. during the introductory speech in the morning the judge asked, "what do we require of citizens?" "loyalty," the two men behind me said. i shivered. but i did see someone i knew there. however, i didn't get called to a panel till after lunch; toby & i took the opportunity to try to kenny & zuke's on 11th & stark (tasty!). i thought the jury selection process was really interesting. we were picked for a criminal case, one with multiple charges (attempted murder, burglary, invasion of privacy). the defense lawyer asked me specifically if i'd weigh the word of a police officer more than a civilian. i said "yes," but what i meant was "yes, INITIALLY." and so i didn't get to talk about the complexity of all that, how i'm pretty sensitive to hierarchy and training, but that i'm also skeptical of spin and need to hear all sides of something before i feel i can make a decision about it. argh. 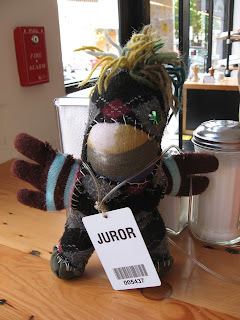 unsurprisingly, they didn't pick me for that jury. (or toby, for that matter.) afterwards, i signed my fee back over to the fund that pays for comfy chairs, microwaves & TVs. * air your tires: they're porous and leak over time. each pump is about 1 psi. * inspect tires for cuts & wear before every ride. fortunately i have kevlar puncture resistant tires w/ slime seal, thanks to mph's suggestion. * keep your chain lubed & clean, as well as your brake pivots. moreso during rainy season. * don't wash your bike; clean the frame with pledge & the rims w/ 409. * check if wheels, pedals & handlebars are secure. * most shifting problems can be solved by turning the cable "adjusting barrel" counter clockwise half a turn at a time. my internal hub has two red lines that should align in 4th gear. this helped validate that i bought the right bike for me; i only have about 1/3 of the maintenance of a typical bike. since i have such an unusual bike, afterwards the tech came outside to point to the spots on my bike that need attention. i also found a new way to lock my bike; my bike baskets get in the way of locking the rear wheel to most things (especially since i've switched to a U lock rather than a combination cable lock, though i loved that cable lock), so he says i can just lock the front fork since it doesn't connect to the quick release section. attending the workshop were 7 girls & 1 boy. my job, as usual, was to ask questions to allow other people to ask questions. so here's the punchline: after the workshop i found the #17 holgate bus waiting for a while at the last stop, so i asked if i could practice putting my bike on the bike rack. if i need to use the bus at some point, i don't want to freak out too much when there's traffic and people waiting for me. and actually, i did this last night, too, with a different driver and with another bicyclist to help me. 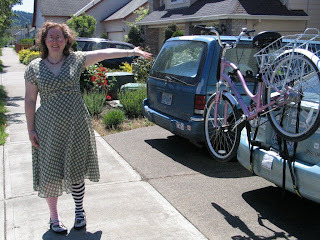 so this time i tried to get rose on the row closest to the bus -- but i think i banged her weirdly, because when i biked away, it was much harder to pedal & shift her than normal, and she ticks while pedaling now, which she's never done before. argh! so now that i've taken the bike to the bike maintenance workshop, i have to take it back to the bike gallery to be fixed. ha! hopefully it's an easy fix and it can get done by saturday, when i'm scheduled to ride in the "pretty dress ride" at the alberta art hop parade. when the weather was so warm and lovely (one day oh, so long ago), sven & i were walking down the hill when we heard an odd sound, like popcorn. 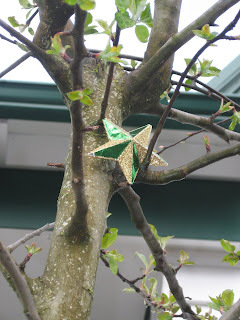 it was the pine tree in our neighbor's yard! only one of the pines was popping, but it was very strange and completely fascinating. and they are so cute, too! i don't usually get gooey about shoes, but these are the shoes i have waited for all my life! shiny AND swirls! 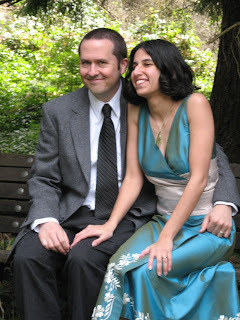 after 7 years of various adventuring, kristen & todd got married on friday. kristen's motto was DON'T PANIC! a small group of family gathered at hoyt arboretum; sven, maggie & i were the only people from portland (unless you count toby & gregory). they didn't have a bridal party, but sven & i got to be the official witnesses. :) after a very short ceremony that included a native american flute and "ode to a nightingale," we adjourned to the kennedy school for a modest but tasty reception. sven and i forgot the wedding gift so after the reception we had to run home and bring it to their house after everyone had gone home.